Eighty percent of Europeans live in cities and towns, but the concentration is particularly evident in France, where 20 percent of the population is concentrated in the Parisian region. Trips around town, which have increased by 40 percent in the past twenty years, are predicted to increase by a further 30 percent by the year 2015. Under the slogan "the city of tomorrow," the Peugeot group is investigating possible solutions to the problems of future urban congestion. If urban transport is to develop and become more practical, it's not enough to turn town centers into pedestrian precincts; individual transportation, the symbol of modern liberty, has to evolve so that it can play an integral role in this overall scheme of things. 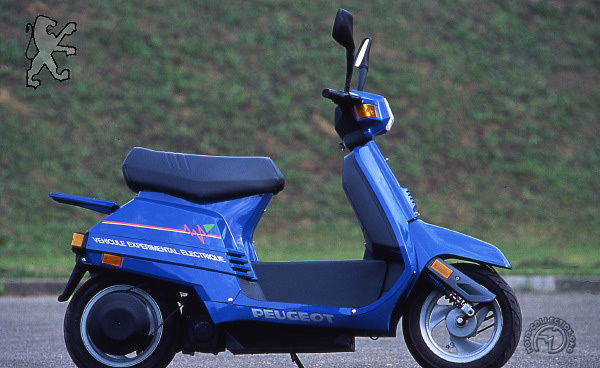 In October 1991, Peugeot unveiled an electric minicar and a prototype electric scooter. The scooter is seen as the typical urban twowheeler of tomorrow, particularly for the younger generation. Based on the 50cc Rapido scooter, but restyled so that it looks as futuristic as its method of propulsion, this totally silent electric prototype can match its gasoline counterpart in terms of speed, though its range is only 25 miles. However, it can either be recharged from a standard household socket or, in emergency, a special charger can regenerate the batteries stowed between the rider's feet to keep the center of gravity as low as possible – in eight minutes. Peugeot chief executive in 1991 Jacques Calvet tries out the "Citela" electric scooter; even with the weight of such an industrial giant behind it, the electric scooter is still several years away from public sale.